So, I’ve been here a week now and, let’s say, there is a lot to get used to; like the gecko I share my bathroom with and the extreme humidity! The other co-directors here have been very kind and patient with me, whilst they show me around everywhere and get me used to the routine here. I now know where to get the vegetables and meat (I think), where to pay the bills and where the night bazaars are! I’ve also been helped with buying a bicycle so I can get around easily and begin to acclimatize! The children have been lovely. They have all helped with cleaning and are always polite. 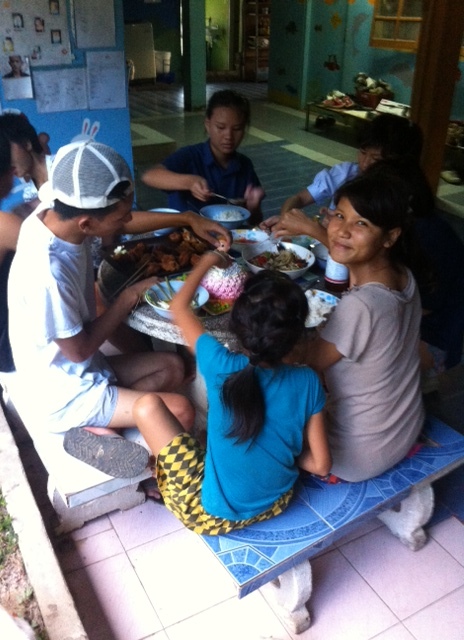 Pratya, our university student, came home this week to deliver his four sponsor letters and to see the other children. We have also had Arisa’s birthday this week, she is now 17, and was spoilt with fried chicken and a birthday cake. The children, all seemed to enjoy it! I spend my time in the evenings watching Thai movies with the youngest, Chichi. I don’t understand what is being said, but I get the gist!